I went shopping with my friend a few days ago and saw that H&M had come out with a lot of new makeup. The first thing I spotted was this palette and it took me less than 5 seconds to decide, that this was going to be mine. I tried it on the next day and wore it that whole day and it looked amazing! It has taking over the illuminating bronzer and blush I used before and I now wear this everyday instead. There are though a few things that confuse me about this product. Is it supposed to be a highlighter, blush and bronzer palette? It look's like it, but the first color (the highlighter) isn't going to work, as a highlighter, on fair to light skin tones and the third color (the bronzer) isn't matte and has warm undertones, therefore it might not work for a lot of people. 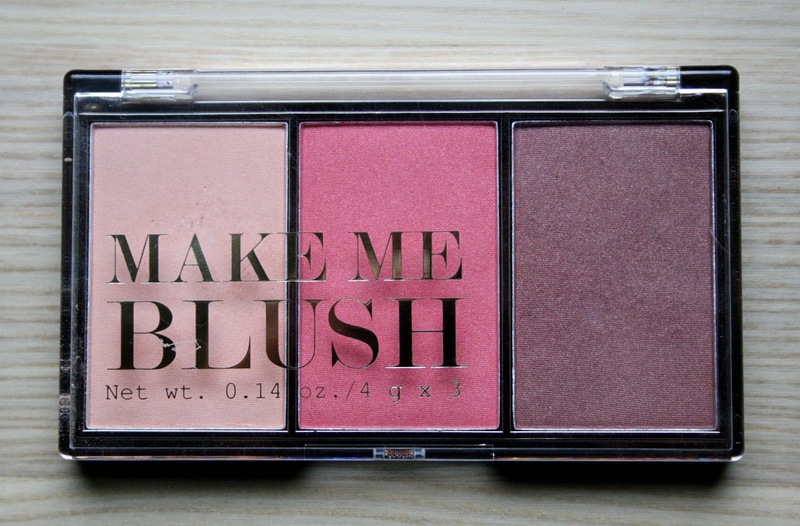 Then I thought, since it's called "Make Me Blush" maybe they are all blush colors. I just don't think that makes any sense, because the first color is too light as a blush and the third color is too dark as a blush. Don't get me wrong I LOVE this product, because I found a way to make all the colors work on my skin tone, but not everyone is going to like that. Below I made a list of the pros and cons, where I explain everything into detail. The pigmentation is on point with this product, it's not super overpowering and it's not sheer either. It's just perfect. Personally I like my blush to have illuminating properties, because it gives my skin a healthy glow, which it definitely needs. As you can see on the swatches above with flash, it just has a slight sheen, nothing too shimmery. Regarding the bronzer it's also slightly illuminating and I like mixing it with the blush color, to create a second, darker blush color. I wore the second and third color over my foundation, concealer and powder and they lasted from around 11 am until I took my makeup off in the evening. That's pretty great if you ask me! The packaging reminds me of the Sleek Blush By 3 Palette, except this has bronze and transparent colors. But the way the blushes are lined up and their sizes are pretty similar. It's slim and compact and easily fits into your makeup bag. Since the highlighter is quite dark and peachy and the bronzer is quite warm toned, this palette will work perfectly on darker skin tones. I tried highlighting under my eyes and on the top of my cheekbones with the highlighter and it was just way to dark. You could easily see a darker, peachy color under my eyes and it just didn't work. But as I wrote before, I found a way to make all the colors work for my skin tone, as for the highlighter I either mix it with the blush for a light blush color or with the bronzer for a lighter bronze blush color. Most people like matte bronzers, because they don't reflect light and therefore will make your face look slimmer. This product is slightly illuminating, I personally like that, and have before this product, used an illuminating bronzer, but if don't like that, maybe just mix it with the blush as I do, and use it as a blush color. My conclusion is that this works best as a mixing blush palette, where you use a bit of this and a bit of that. It's also fun, because you can customize you exact color. I would recommend this for people that like illuminating products and for people with a darker complexion.